Islandwide Homeless Restrictions Approved — But Are They Legal? The Honolulu City Council gave the green light Wednesday for police to start citing people for “lodging” on public property or blocking sidewalks across Oahu. Now the question is whether that’s legal in light of a recent federal court ruling. The council gave final approval to Mayor Kirk Caldwell’s proposals to prod homeless people into shelters and clear public spaces of encampments. Under Bill 51, anyone obstructing a public sidewalk from 6 a.m. to 10 p.m. is subject to a $100 fine or community service. Bill 52 makes it a petty misdemeanor to “lodge” in public at all hours. Lodging is defined as “to sleep; to come to rest and refuse to vacate.” Police must verify a shelter bed is “readily available” and offer a ride to the shelter before citing someone. Greg Sievers pushes his cart across Isenberg Street after being evicted from a public area at 1:30 a.m. New city laws could require homeless people to enter a shelter or face fines. The council passed both bills in October, but required the Caldwell administration to submit a plan outlining solutions to the homeless crisis before they could be enforced. A council committee rejected the administration’s plans twice over concerns that services are not evenly distributed in all nine council districts and that the new ordinances do not pass constitutional muster. On Wednesday, a revised plan was approved. The 9th U.S. Circuit Court of Appeals ruled in September that an anti-camping ordinance in Boise, Idaho, violated the U.S. Constitution’s Eighth Amendment, which protects against cruel and unusual punishment. 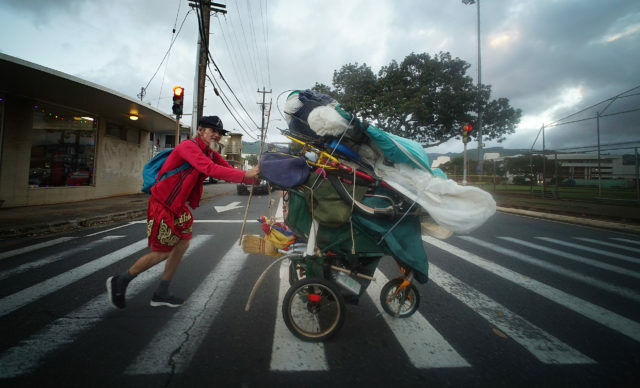 The appellate panel found that if there is no option of sleeping indoors, governments can’t criminalize homeless people for sleeping on public property “on the false premise they had a choice in the matter.” The ruling affects nine Western states, including Hawaii. Some cities have changed their practices in light of the ruling. San Francisco and Portland officials plan to stop prosecuting homeless people for violating sleeping ordinances, according to the policy journal Governing. The court opinion found that even if a city has enough shelter beds for its homeless population, some people still might not be able to access a bed. One homeless plaintiff in the case had to leave a shelter because he did not want to follow its religious program required after a 17-day time limit was reached. “Just because a shelter says we have 10 available beds doesn’t necessarily mean the person who’s being prosecuted for lodging on a public sidewalk can actually use one of these beds,” said Joshua Wisch, executive director of the American Civil Liberties Union Hawaii, which opposed the measures. Honolulu Housing Director Marc Alexander said Honolulu has a plethora of shelter options. He also said Honolulu’s new lodging ban is unique because of a provision that police can’t cite someone without first ensuring shelter space is available. “You’re violating the law when you have (shelter) options,” Alexander said. Marc Alexander, the who heads the city’s Office of Housing, argued the new bills help maintain public order while giving homeless people the option for services. Critics maintain coercing people into shelters with the threat of fines is a waste of public resources that could be dedicated to permanent housing. It also costs taxpayers a lot to enforce laws that have no proven positive results, she said. Meanwhile, social service agencies vie for limited rent subsidies and housing vouchers. Homeless people in Boise can choose between three emergency shelters. There are at least 29 on Oahu. A snapshot of vacant shelter beds on Oahu taken on the last day every month shows that through October, 315 beds on average were available on a given night. The 2018 point in time count counted 2,145 unsheltered homeless people on Oahu. The shelter data isn’t always accurately reported – the October report, for example, showed 28 available beds at Next Step shelter in Kakaako. Jason Espero, who runs the shelter, said his own records indicate there were in fact only 10 available beds. Outreach workers have reported difficulties finding shelter beds. Joe Acosta, the field services director for the homeless service nonprofit ALEA Bridge, said each week his team of outreach workers finds three to five people who want to enter shelters, but only two or three actually get in. This week Acosta, has six to eight people on waiting lists for shelters. Alexander said the new laws don’t mean all homeless people will be cited at once. Instead, he said, it puts the onus on the city to find suitable shelter space. Doing so ultimately helps homeless people by removing them from potentially unsafe and unsanitary living conditions, he said. 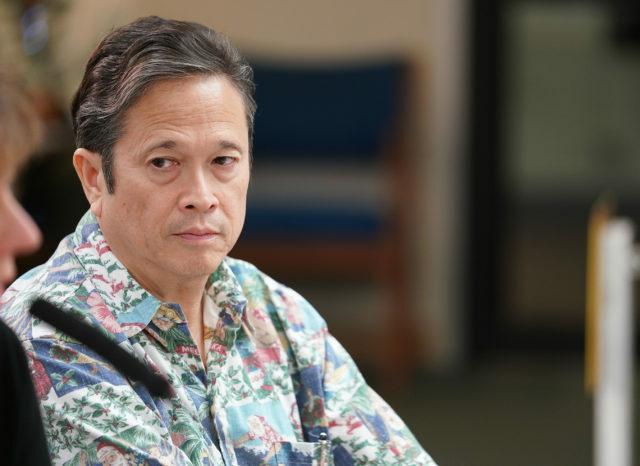 Honolulu Police Capt. Mike Lambert, right, is part of HELP Honolulu, a collaboration between police and social workers, that aims to get homeless into shelters. Now he wants to bring a new kind of shelters to the homeless. The Honolulu Police Department is coming up with creative ways to enforce the new laws, including temporarily putting inflatable tents in parks that would serve as holding areas while shelter space is located. This would be especially necessary after-hours when many shelters don’t accept people. 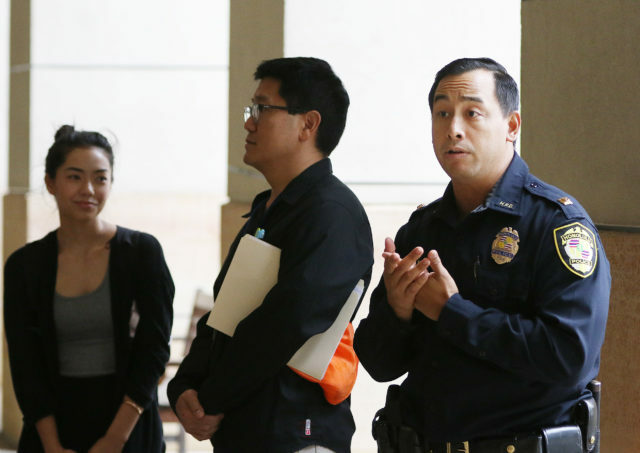 “We’re talking about 1 a.m. What do we do with the guy at 1 a.m. who says I want services and perhaps intake is not readily available?” Honolulu Police Capt. Mike Lambert, who is working on the so-called “lift zones,” said to the City Council Public Works Committee on Tuesday. Homeless people are already offered services and rides to shelters, without the threat of arrest or fine, through the HELP Honolulu program, a collaboration between police and social workers, and the outreach that happens before the state and city sweep areas. The HELP program put 175 people into shelters, detox beds or medical treatment beds from April to November. Another 223 went into shelters or housing thanks to other state and city outreach efforts. Homeless encampments persist despite these efforts. 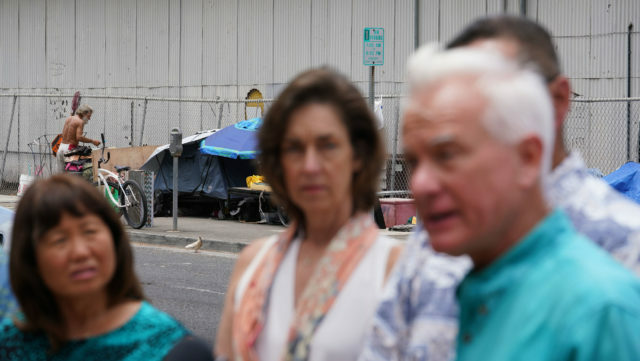 Honolulu Mayor Kirk Caldwell, right, announced his proposals for new homeless laws at a press conference across the street from the tents of homeless people in Kakaako in June. Alexander said people are more likely to find permanent housing once they are in a shelter. Kimo Carvalho, the director of community relations for the Institute for Human Services, said the homeless bans help budge homeless people who refuse to go to shelters. “We kind of use enforcement as a referral source, not the opportunity to ticket everyone,” he said. Others say emergency shelters shouldn’t be required as an interim step to permanent housing. Staff at shelters are often ill equipped to accommodate people with complex challenges like mental illness or drug addiction, he said.